A Curious Workshop Awaits sign up now for October 13th! Let’s take a trip with Alice down the rabbit hole and discover a world where logic and reason have been turned upside down and, contrary wise, downside up. This workshop will explore the unusual cast of characters that inhabit Wonderland as we create them as well as the world in which they dwell. This entry was posted in Workshops/Classes. Bookmark the permalink. I LOVE Alice! Can you tell me more about the course? This workshop will be divided into two parts. Part One: The Wonderlanders – The first portion of this online class focuses on creating a variety of the characters from Lewis Carroll’s Alice’s Adventures in Wonderland and Through the Looking Glass. We will be using a combinations of everyday found objects, clay, wood and paint to reinvent these Wonderlanders. 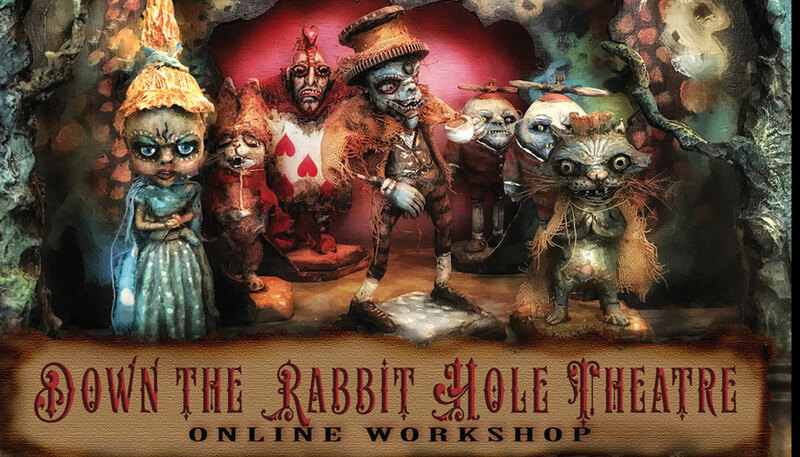 Part Two: The Rabbit Hole Theatre – In the second half of the class we will create a stage for our puppet thespians to enact the various scenes from the books. The stage will consist of a block or wood or shallow box. We will construct trees to frame our stage as well as layered cut-out back drops to create a tunnelled effect. Of course, we will also be transforming these backdrops and with yummy alternate-worldly effects using paint a variety of painting techniques. I found the description of the course. Do you have a list of materials? Thanks! Thank you for your questions about the Altered Alice class. 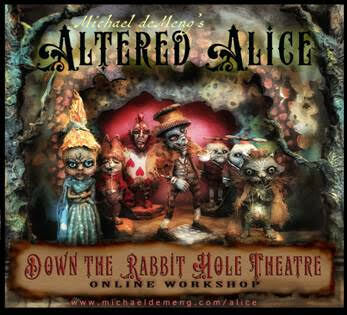 The classes on our site are all classes through various artist and teachers that submit the classes to us to post that pertain to our products – that said Im happy to put you in contact with Michael deMeng so you can get an idea of the supply list maybe ahead of time: here is the course description: Let’s take a trip with Alice down the rabbit hole and discover a world where logic and reason have been turned upside down and, contrary wise, downside up. This workshop will explore the unusual cast of characters that inhabit Wonderland as we create them as well as the world in which they dwell. – I did also find in his FAQ from the class link this information: “What will happen after I sign up? Initially, I will send out a link to the Altered Alice Facebook Group On Oct. 13th I will send out the secret codes and links to get you rolling.” typically these links contain the lists of things you need. You can contact Mr deMeng and his group through his facebook page listed under “deMeng Workshop Junkies”. hope that helps! Could you put me in contact with Mr. deMeng, letting him know I’d like to see a list of materials? Thanks!